When I'm not out in public as a Vicar (ordained in the online Universal Life Church! ), I actually sing in the church choir directed by my wife. We're in the rotation for the Lake Harriett Bandshell service and our Sunday is this one, at 10AM. If you're in the area, stop by, and hear us sing. It's not as traditional as The Blessing of the Bicycles and in fact we're singing some pretty catchy tunes. Sunday afternoon there's a benefit for Chris Zito, who was hit and badly injured by a hit-and-run motorist on March 30th. The benefit is Sunday the 27th starting at 3:00 at the Nomad World Pub on the West Bank of Minneapolis. There's a ride to the Nomad World Pub originating at Minnehaha Coffee (4554 Minnehaha Avenue) in Minneapolis at 2:00, there's music, there's food, there's beer. Finally, next Saturday, June 2nd at 7PM, my son Henry and the Minnesota Boychoir are singing with the Twin Cities Gospel Choir. They'll be at University Lutheran Church of Hope at 601 13th Avenue SE in Minneapolis. It ought to be a cookin' concert. There has been an email going around suggesting that we all boycott buying gasoline on May 15 to bring the oil companies to their knees and compel them to reduce the price to $1.30 a gallon, where it apparently belongs. Well, dubious though I may be about these efforts, I dutifully did my bit and didn't buy any gasoline yesterday. Due no doubt to you petrol-buying slackers, these efforts appear to have been for naught. Oh well. I did go to the Saint Paul Bicycle Advisory Board Bike Summit down by Boca Chica. It was ill-attended, probably due to the lack of publicity. I think my blog entry was about the most obvious announcement of the meeting, so the handful of non-BAB, non-presenters at the meeting was a disappointment compared to last autumn's 100 or so attendees. This session was really looking for comments on the bicycle portion of the transportation plan, not as open-ended a discussion as at last fall's Summit. There was some discussion of the power of the railroads in the context of the Midtown Greenway (which is now looking to build its own Mississippi River bridge rather than share the railroad's existing Short Line bridge), the Saint Paul part of the Greenway and the powerlessness to do anything about the Raymond Street bridge, which has a fairly horrid bend in the road and blind spot. One interesting discussion during the break was with the City of Saint Paul engineer talking about Stop signs. Apparently, most residential streets used to have no Stop signs, they were uncontrolled intersections. The resulting accidents prompted the city to put in Stop signs on what he called a basketweave pattern, e.g., one every two blocks in opposite directions. Accident figures dropped, everyone was happy. Now, as time has gone on, people have become used to these signs and, as I noted in a recent entry, don't really stop, but slow down, take a quick look, and roll on through. By people, I mean motorists, not just cyclists. Accident rates at these intersections are now back to pre-Stop sign levels plus the city has got the cost of installing and maintaining all these signs. One proposal is to make all these intersections four-way stops which means, as one citizen apparently put it, it takes two idiots instead of one to cause an accident. This of course chops up travel even more--stopping (or pretending to) every block instead of every two, and is twice the number of signs that the city has to install and maintain and undoubtedley people will adapt to this, roll through these as well and, after an initial drop in accidents, no doubt the rate will creep back up. I noted that there are some uncontrolled intersections in residential Minneapolis and I always creep up to them, afraid of someone barrelling down the opposing road. The engineer guy said that is often the case, that the responsibility is on the drivers and they take extra care. He said often as not, the safest bits of the highway are those known as Dead Man's Curve or Suicide Hill because everyone knows they're dangerous and takes extra care. Uncontrolled intersections are the same; people are cautious because they don't know what to expect. In the insurance industry, we've seen the same sort of effect with anti-lock brakes. When they first came out, the assumption was this wonderful technology would make driving safer. In fact, the loss experience for ABS-equipped and non-ABS equipped automobiles is virtually identical. Where once, pre-anti-lock brakes, you'd creep gingerly up to icy intersections ready to pump the brakes, now you just zoom right up and stomp on the pedal, knowing the clattery ABS noises will keep you from locking up your wheels. It's been noted that people would drive a lot differently if there was a pointy metal spike sticking out of the steering wheel rather than a pillowy airbag. They'd drive differently if residential intersections were all uncontrolled, too. This also ties into another bike program, the Share the Road signage. Saint Paul has Share the Road signs on a number of streets, which is good I guess, but many have their own poles and, speaking as someone who lives on a busy street, I'd be really annoyed if someone came along and slapped a pole in my front yard with a Share the Road sign on it. I was relieved a couple of years ago when some motorist crashed through our telephone pole, mailbox and street sign into our lilac hedge (then, in true motorist fashion, left the vehicle and ran off into the night). The power company replaced the telephone pole, I fixed the mailbox (which has since been hit again, again by someone who took off) but I just cut off the bent-over street sign and it was never replaced, which made me happy. I hate to say this, but I think Share the Road signs are just more visual clutter, something we can do with less of rather than more. I rode to the Summit on my Atlantis dressed in regular work clothes--dress slacks, dress shoes, white shirt, tie. It was a good evening for this, as riding there involved a ferocious tailwind and 200 foot drop in altitude, and the wind was mostly gone by the time I rode home. I did pass a couple of Mormon missionaries proselytizing some guy at a bus stop. They, too, were on bicycles, with helmets, in white shirts, ties, dress slacks and shoes. This makes the Dressed Up Cyclist the perfect cycling uniform--if you overtake a slower cyclist, it's extra-humiliating for them to be overtaken by a guy in a tie; if you get overtaken, well, it was just some guy all dressed up, who couldn't overtake someone like that? ; and strangers won't bother you for fear of being recruited into the Church of Jesus Christ of Latter Day Cyclists. When I told my wife that I looked like a Mormon missionary she pointed out that, no, they're usually young and attractive. Ouch. There are a couple of bicycling-related things going on next week that may be of interest. First, for Saint Paul cyclists or those who have an interest, the Saint Paul Bicycle Advisory Board's revised Saint Paul Bicycle Transportation Plan is going to be presented for public comment on Tuesday May 15 from 6:30 to 8:30 at the Paul and Sheila Wellstone Center for Community Building, 179 Robie Street East, Saint Paul. There is a link to the plan and map at the Midway TMO website, look at the upper right. In the way that these things work, this plan has been distributed to District Planning Councils for comments, this meeting is for public comment and it will be forwarded at the end of the month for inclusion in an overall Saint Paul Transportation Plan. Then, on Friday May 18, it's Bike to Work Day! I've never participated in the events since they seem to be very oriented towards people going to the downtowns whereas I start in Saint Paul and head north, but this year I may help out in downtown Saint Paul. I expect that if you are reading this blog you know about commuting; if you're new to it, May's a great month to start. There are a bunch of rides planned, so maybe one will fit your needs. Hope it doesn't rain! One of the most common complaints aimed at cyclists by motorists is how cyclists never stop at stop signs or red lights, but just sail on through. This complaint is levelled as if motorists were all innocent little law-abiding lambs when in fact almost all motorists speed almost all the time (try driving the speed limit all day one day, and you will discover that speed limits are viewed as suggested minimums rather than legal maximums) and a huge percentage don't stop at stop signs, either. Just watch the wheels--if it's an uncontested stop (no opposing traffic), motor vehicles will slow down, look back and forth, and go on through without ever coming to a complete stop. Is this outrageous behavior? Not really. It's how I drive, and so does virtually everybody else, though for some reason when cyclists slow down, make sure it's clear and then proceed, it raises the ire of motorists. There's a good reason for this behavior, and it has to do with conserving momentum. It's a somewhat bigger deal for cyclists, who have tiny reserves of power and hate to squander it in coming to a complete, track-stand or foot-down stop, then have to accelerate from zero, over and over again (read about this in a couple of articles by a prof at Berkeley here in English and here if you want to check the math). It's a factor for autos, as well, and people who swear that they stop will slow down to 6mph or so (I've paced many motorvehicles through stop signs to see how slow they were) and then go. Well, one guy stops. 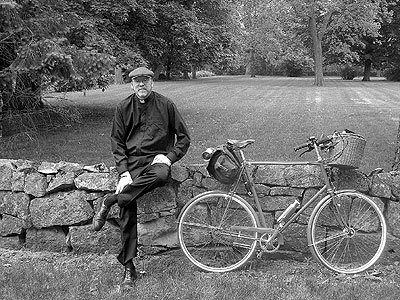 In Slate magazine one of their columnists made a comment about this yesterday, in relation only to cars and having nothing to do directly with bicycles. Possibly bad idea of the day: I got a ticket a couple of years ago for failing to come to a complete stop at a stop sign. I was so guilty. Ever since then--and after I was admonished by a cop I met at a party--I've tried to come to a total, 100% stop, with the weight of the car falling back on its haunches, before stepping on the accelerator to get moving again. When I do this I can hear and actually feel the engine sucking in vast quantities of precious refined petroleum to overcome the inertia of 3400 pounds of metal at a dead rest. Which leads to the thought: Wouldn't we save a lot of gasoline quickly and cheaply if we replaced most of our "STOP" signs with "YIELD" signs? I'm sure there is a safety argument against this, but I'd like to hear it, along with up-to-date comparisons with countries that rely on "yield" more than "stop." ... N.B. : a) You could still require that everyone slow down to under, say, 10 miles per hour. It's the first 10 miles per hour starting back up that seem so gratuitously wasteful. (Maybe "YIELD" is the wrong sign. Maybe it should say "SLOW to 10.") b) Traditionalist drivers--e.g. geezers--could still come to a complete stop and retain the right of way. c) Policemen could still raise revenue for their employers by giving lots of tickets--they would just be tickets for "failure to slow" or "failure to yield." ... 3:51 P.M. (here's the link). People already do this. Interesting that he picked 10mph when people often do 6 or so already. Maybe a car going from 30 to 6 looks like a stop but a bike going from 14 to 8 doesn't. (I've written about this before, in July 2005: you can read my previous masterpiece here if you missed it the first time around). Separately, there's a flap on in Toronto where a motorist got pissed off at a cyclist (ironically, for stopping for a yellow light), got out of his car, and punched the cyclist, breaking out a tooth. Nothing out of the ordinary, except that some school kids were filming it. It turns out the motorist was an off-duty cop. One wonders at the message being sent: "You cyclists piss me off because you never stop at stop signs or red lights, but by God, if you do stop at one in front of me, I'm going to punch you out"? You can see the video over at Martino's Bike Lane Diary and the links flowing out from there. Reading through the comments can be both entertaining and annoying--some note that the teacher was hot, others say they have conceal and carry laws in Florida and that they'd just shoot the cyclist in the face. That seems like a twisted fantasy; if you want to kill a cyclist, all you have to do is run them down and you're likely to get away with it. Just make sure no school kids are filming you at the time. COPENHAGEN -- No one wears bike helmets here. They're afraid they'll mess up their hair. "I have a big head and I would look silly," Mayor Klaus Bondam says. People bike while pregnant, carrying two cups of coffee, smoking, eating bananas. At the airport, there are parking spaces for bikes. In the emergency room at Frederiksberg Hospital on weekends, half the biking accidents are from people riding drunk. Doctors say the drunk riders tend to run into poles. Even in Amsterdam, not everyone is pro-biking. Higher-end shops have already moved out of the city center because of measures to decrease car traffic, says Geert-Pieter Wagenmakers, an adviser to Amsterdam's Chamber of Commerce, and now shops in the outer ring of the city are vulnerable. Bikes parked all over the sidewalk are bad for business, he adds. You need a subscription to see the WSJ online, but I did a PDF of the article which you can read here. Speaking of Amsterdam bikes, there's a web page with some interesting photos I like despite myself. It's at Amsterdam Bicycles and is 82 photos of bikes in Amsterdam taken in 73 minutes last autumn. Here, let me be catty for a second and say what I don't like about this page. Deficient Photos - many of the photos are blurred. He needed a faster shutter speed or to pan with the bikes and in some cases the autofocus picked up on subject matter behind the bikes. This can probably be forgiven since he wanted to run all the photos he took. I've certainly had that impulse before. Unfamiliarity with subject matter - this shows mostly in his vast overestimation of the effort required to run a bottle generator but also on his frequent reference to $15 or $20 bikes. Generators take little effort and free you from batteries and these bikes are worth lots more than $20. Many of his mistakes are gently pointed out in the comments that follow. Annoying tic - in this case, "riding his bike in Amsterdam". Over and over again, it's Here's a lady in a dress talking on the cellphone riding her bike in Amsterdam. Yes, we know she's riding a bike and it's clear from the last 20 times you said this that it's in freakin' Amsterdam, so stop it already. OK, I feel better now. Despite these gripes, it is an interesting set of photos because the mode of dress and riding is so much different than what we normally see here and the photos get this across. Although I haven't previously posted this link, I think Cleverchimp did, and it's another set of Dutch cylcing photos from an apartment's second story. Again, a completely different riding vibe than we get in the Cities. Note that when you open this the use of white space on the front page of this PDF makes it look like it's blank. It's not. Finally, the Cleverchimp guys are opening a bike store carrying some of the Dutch Cargo Bikes. It's called Clever Cycles and will be open soon (and, as I copy the links to put in here, I see he beat me to the WSJ story...oh well). Blueberry died today. 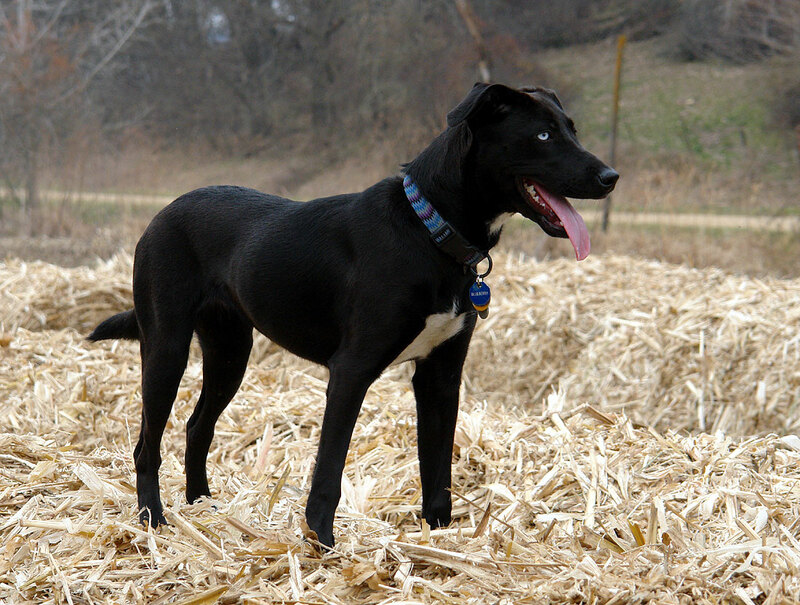 She was our dog, just over a year old, we adopted her in September. She worked her way into the family, becoming a fixture in the house, with the usual dog adventures of accidental poops in the hall, eating Henry's unattended hamburger, Geneva's entire birthday cake and annoying the cat. We got used to each other and she was one of us. We are generally responsible pet owners, keeping her shots current, feeding her decent food and walking her on a six foot leash. Today, though, she got out, chasing after some bunnies and squirrels. Karla went out after her, but Blueberry on the loose can be elusive. Karla was behind the house when she heard the skid and the Yipe! from out front. Karla ran out there; the car had left, but Blueberry was on the curb. She was badly hurt, and snarled when Karla touched her hindquarters. Her tongue was bleeding. A policewoman showed up, and she and the mailman and Karla got Blueberry on a blanket and into the car; to the vet, fortunately close by; it was morphine and a muzzle and xrays; a tearful phone message on my voicemail while I was at lunch; a broken left rear femur, collapsed lung, perforated organs, internal bleeding, air and blood bloating her abdomen; off to get Henry from school; me back from lunch and off to the vet; the dog, sleek and clean after the bath Geneva and I gave her last night, a mask on, asleep on her side, with labored breathing; a sombre talk with the vet; Henry and Karla tearfully out of the room; stroking Blueberry gently as she got the shot; twenty seconds and the breathing just stopped; a brief search for a heartbeat; Blueberry was gone. I went to get Geneva from school as well, plucked her from class for a tearful ride home, all Kleenex and remorse about having been annoyed about having to help with the bath, home for hugs and tears and tea. And so tonight we find ourselves missing her presence already, no excited dog tumbling down the stairs to greet us, no hesitation before getting up from the recliner to allow Blueberry to leap out of the way, no "Walkies!" with her tail wagging so hard her whole back end goes back and forth. Her sudden departure has left us with the towel still damp from last night's bath, some fur from the bathtub a forlorn reminder in the garbage. Blueberry at the farm at Thanksgiving. 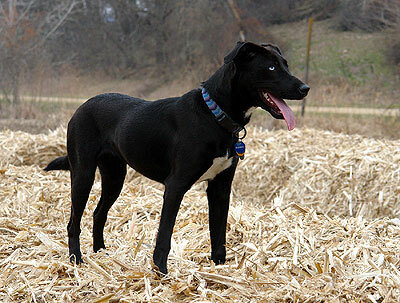 She was about 50 pounds, mostly Lab, who knows what else, with striking pale blue eyes and delightful ears. Does this have anything to do with cycling? No, not really, other than to remind us how quickly things can change, to remind us that too many motorists will just drive off, maybe it was just a dog this time, but a couple of years ago a couple of blocks away it was an older gentleman, he was dead too, and that motorist didn't stop either, and they still haven't found him. It could be any of us. Be careful out there.